Throughout history, consumers have constantly redefined notions of edibility. What is considered food one day may be deemed taboo the next. Ingredients that have been consumed for centuries have disappeared with the advent of dietetic fads and trends. Tripe vanished and saturated fats were deemed evil, whilst organic produce made a comeback after the chemically-driven Green Revolution that followed World War II. Across the world, blood remains a valued and, at times, vital culinary ingredient. It is the essence of life coursing through our veins, carrying with it an air of dark, folkloric mystery. It is also commonly consumed in many food cultures, where it is used to thicken stews and enhance savory dishes. Its striking color compliments the sweetest of desserts. Without a doubt, the most common culinary appearance of blood is the blood sausage. 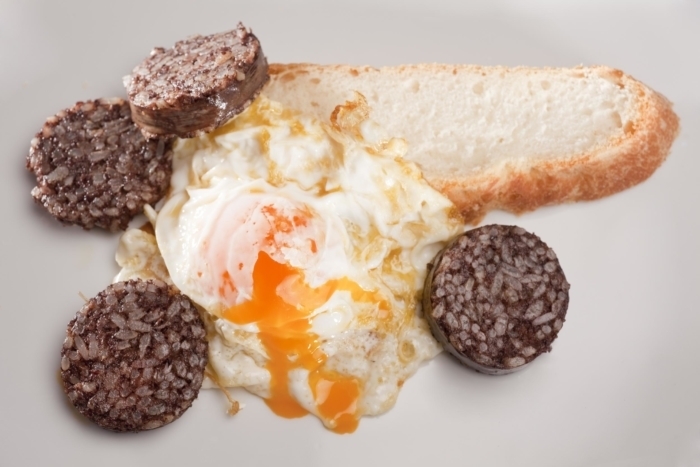 In England, it is referred to as black pudding, in France it is boudin noir, and in Spain, there is morcilla. 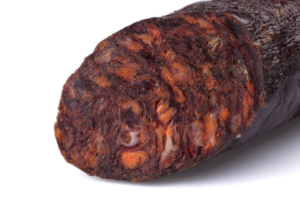 Though dark and pungent, morcilla is perhaps the most enticing of all blood sausages, unique in flavor and steeped in meaning. Across Europe, the constituent elements of a nation’s blood sausage are, dare I say it, somewhat predictable. For instance, in England, it will almost always contain oats. In France, eggs are often incorporated. In Spain however, things become a little bit more exciting. Morcilla is emblematic of Spain’s gastronomic philosophy. It reflects the country’s commitment to minimizing food waste and their deep respect for eating local. Spain has a fantastically diverse array of regional cuisines, and as one travels the country, new flavor profiles and combinations emerge. To eat in the Northwest of Spain is an entirely different experience than it is to eat in the Northeast. What does remain constant throughout the country’s cuisine, however, is the nose-to-tail locavore approach to consumption. It comes as no surprise, then, that morcilla is consumed across Spain, yet its flavor varies substantially depending on the region. Each regional variety of morcilla symbolizes the history and agriculture of its origin. To eat the morcilla of Andalusia is to consume remnants of Middle Eastern rule in Spain; to sample the sausage in the North is to capture flavors brought over from the New World. Perhaps the most renowned variety of morcilla is produced in Burgos. Located in Northern Spain, Burgos sausage contains rice, fat, blood and spices (usually paprika and oregano). The locally grown horcal onion lends a distinctive, yet ever so subtle sweetness to the sausage. Along the coastal region of Asturias, smoky notes come to dominate the sausage’s flavor. Owing to the wet terrain, families resort to curing the meat in their fireplaces as opposed to the traditional method of air-drying, and as a result, morcilla de Asturias is firmer, darker, and saltier in flavor. Travel to the Canary Islands, the cluster of Spanish islands just north of Morocco, and the morcilla becomes sweeter. Morcilla dulce utilizes ingredients found in many North African dishes, such as raisins and almonds. Those living in the famous wine producing region of La Rioja also demonstrate a preference for the sweeter morcilla dulce. Sugar and a warming mixture of spices, such as cloves cinnamon and nutmeg, are added. So how is the morcilla used? Once again, this is subject to regional preferences. For instance, the smoky variety of Asturias finds its way into their famous fabada stew. Many boil the sausage in cider, Spain’s popular apple-based beverage, or simply serve it on its own, sauteed in a olive oil (of which Spain produces some of the world’s finest). Despite Americans’ repulsion to blood, in many other parts of the world it is considered a highly nutritious and versatile ingredient. In an age where food waste in the West is a growing predicament, perhaps we can learn a thing or two from Spain’s gastronomic ethos. Within Spain, the blood sausage serves as an emblem of the country’s philosophy: savoring all, wasting none, and celebrating the rich bounty and diversity of flavor. 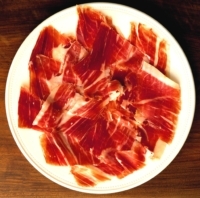 The Devil Dangled Jamón Ibérico Before My Eyes. I Caved in and Fell in Love.